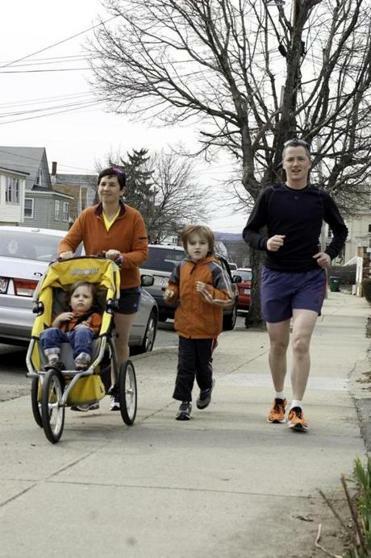 Carolyn and Jesse Edsell-Vetter during a training run with their children, Ethan, 2, and Yoni, 7.
been cheering them on throughout their four months of training. Representatives from the Metropolitan Boston Housing Partnership will also be rooting for the Medford couple, who reported raising $21,800 at press time. According to Carolyn, she’ll need the encouragement. Friends of Carolyn and Jesse Edsell-Vetter’s young children collected change to donate to the goal. The couple has raised about $50,000 in the past five years for the housing partnership, which helps clients find and maintain housing. They said they will power through inevitable exhaustion and pain because of their dedication to the cause. 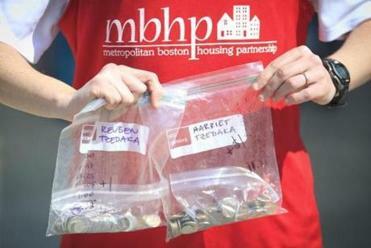 “We feel pretty strongly about the work that’s being done,” said Jesse, who is the hoarding intervention coordinator at Metropolitan Boston Housing Partnership . The organization says it aims to assist homeless, elderly, disabled, and low- and moderate-income individuals and families. Jesse works with clients, property owners, and outside agencies to make sure that the people he works with have a place to live regardless of challenges like hoarding or mental health issues. The Edsell-Vetters’ efforts to assist those with housing needs are not going unnoticed. Carolyn, left, and Jesse Edsell-Vetter, are running the Boston Marathon to raise money for Metropolitan Boston Housing Partnership. 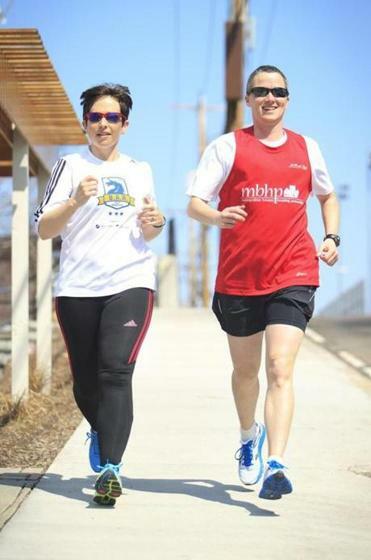 This year’s marathon will be the couple’s fourth on behalf of the housing organization, and they said that it was particularly tough training for this one. Because of Carolyn’s injury, she had to adapt her methods and spend a lot of her early training time in the pool. “I’ve learned a lot about a different way to tune into my body as a result of being injured,” said Carolyn, who had worried that she wouldn’t be able to get her body up to speed in the water. Despite challenges, it was never a question for the Edsell-Vetters as to whether to run for the Metropolitan Boston Housing Partnership, especially because this is the 10-year anniversary of three events: their wedding, Jesse’s last knee surgery, and Jesse’s arrival at the housing partnership. Much of their lives and the way they raise their children, Yoni, 7, and Ethan, 2, revolves around the organization’s mission as well as the principles of Judaism. “A huge part of our belief system is this idea that we’re all sort of called to be partners with God in repairing the world,” said Carolyn. For this family, their way of repairing is to make sure that everyone has a place to call home. According to Jesse, the children are just as passionate about this goal as their parents. The Edsell-Vetters said their children acted as cheerleaders during this year’s training, providing moral support and enthusiasm. Yoni once again took fund-raising into his own hands. By asking family, teachers, neighbors, friends, and parents of friends, he has raked in $519 so far for a 5K he will run on Mother’s Day for the housing partnership. Jesse said he never considered giving up during his training, but one event did change his perspective: the passing of Metropolitan Boston Housing Partnership’s director of policy, development, and external relations and his personal mentor, Mary Doyle, who died at her home in neighboring Arlington in February.